Thai curries are famous for their distinct flavors and the coconut base. And I love the fact that you can create beautiful variations by using different types of curry pastes or spice blends to make a red, green or yellow curry. 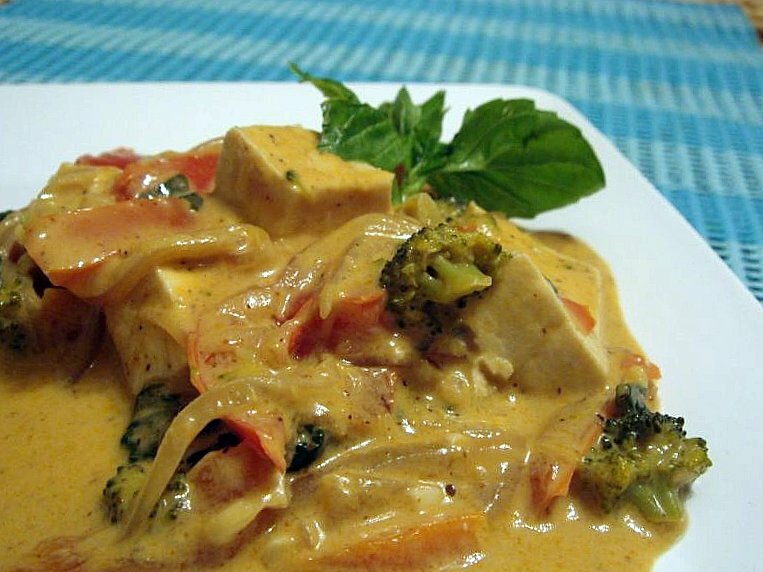 This Friday night, we experimented with the Thai Red Curry made with Tofu and vegetables. What better way to get some protein, vitamins and loads of nutritious juices into our system than make a fulfilling curry! The best part, it was so easy to make, did not need much preparation, as we used a ready-made paste, and it tasted great with hot Jasmine Rice. Perfect for Vegans too! Flavored with lemongrass, basil, kafir leaves and laden with veggies, tofu and bamboo shoots, this Thai Red Curry is surely something that will please your palates! Cook the onion in oil in a wide 4-quart heavy pot over moderately high heat, stirring occasionally, until pale golden, about 3 minutes. Reduce heat to moderate, then add garlic and curry paste and cook, stirring, 1 minute. Stir in coconut milk, salt, and remaining 1/4 cup water and bring to a boil. Stir in vegetables and return to a boil. Cover pot, then reduce heat and cook at a brisk simmer, stirring occasionally, 2 minutes. Gently stir in tofu and simmer curry, partially covered, until vegetables are tender, 7 to 8 minutes. Remove pot from heat and stir in fish sauce and salt to taste. To make Jasmine Rice, rinse rice briefly in a sieve and drain, shaking sieve to remove excess water. Bring rice and 1 1/2 cups water to a boil in a 1 1/2- to 2-quart heavy saucepan over high heat, then cover pan with a tight-fitting lid and cook rice over low heat until water is absorbed and rice is tender, about 15 minutes. Transfer the delicious Thai Red Curry with Tofu in a serving bowl, garnish with some basil and lime wedges, and serve hot with Jasmine Rice. I love Thai curry...admittedly I love the green curry the best...but all Thai curry is good! And Tofu and veggies...bonus! Have always loved thai red curry...cant wait to try myself. Always a favorite of mine. I keep some red curry paste in the fridge at all times, but I have to use it judiciously because Sir Pickypants finds it just a bit too spicy. Now I want to get some coconut milk and have at it! This looks delicious. My family loves Thai red curry. Not overly fussed on Tofu but its not too bad when its infused with the curry and spice flavors. Your dish sings to me!! I don't like tofu but I will substitute it with chicken! Ahhh Red curry, makes me want to dig in right away! Thanks for posting Red and Green Curry/paste recipes. I love Thai Yellow curry. Can you please post the yellow curry or atleast the paste recipe? Thanks a lot in advance!! I love any dishes with curry. I can't wait to try it. This is something that I would love to try. I love Thai food a lot. The Thai curry dish looks mouthwatering! Nice job! Thai curry looks so delicious. Wow, I love Thai foods. It's looks like delicious. Thanks and have a great day! Hi.. I never tried to make any Thai dish.. This curry seems to be so yummy.. I really wanna taste it.. Thanks for sharing such new dish !! !